One of the most popular snacks in Korea, Kimchi jeon is made from Kimchi, flour batter, some vegetables and sometimes meat, often ground pork. The brine from the Kimchi is usually added to add flavour and colour to the snack. It is a very easy snack to make. Adding some squid will provide a crunchy contrast to the softness of the pancake. For a spicier treat, add a dash of red chili paste to the batter. As with most Korean meals, ingredients can be varied to achieve a different taste.Ripened Kimchi is better used in making the snack to give it a tangy flavour. 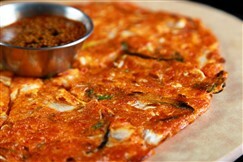 Usually served with alcoholic beverages, Kimchi jeon is an ideal snack for cold or rainy days and warm weather. It can also be served with a spicy dipping sauce or a simple soy and vinegar sauce. To make adelicious vegan snack, leave out the meat. Kimchi Jeon is best eaten warm from the skillet.